I woke up this morning from the constant crackle of heavy rain on the hut’s tin roof. Dave arrived for breakfast in full gear, dripping wet. The 20 meters from the lower hut up to the main hut were enough to soak him good. Nobody was too keen to get out and a about in a hurry, so we enjoyed a long breakfast listening to National Radio. It was pouring down when Dave and I stepped out of the hut in full wet weather gear at around 10 am. As there weren’t any pressing matters at hand today, we started out by having a quick look at the boat harbour. Only to be surprised by what we found there. The animal snoring on the rocks on the other side of boat harbour goes by the Latin name of Hydrurga leptonyx, was about four meters long, had a sleek, snake-like appearance and had short, light gray fur with dark blotches. And if it wouldn’t have been snoring away quite happily it probably would have flashed it’s massive ivories at the sea lion bull nearby. The latter obviously impressed by the presence of such a large leopard seal. It’s the first leopard seal I have seen in the wild. The first thing I noticed was that even though there was one of the fiercest predators of the Southern Ocean, it looked peculiarly harmless out there on the rocks. Reason for this was that unlike the sea lion, the leopard seal as member of the family Phocidae can not turn their hind flippers downward to use them like feet when on land. As a result, the leopard seal over there seemed more like a fish out of water, rather than a danger to anything that moves in its vicinity. Nevertheless, it seemed that the sea lion nearby was eyeballing the seal as if he expected it to lurch forward any second to take a bite out of his bum. A relaxed sea lion definitely looks different. In the water of the harbour a bunch of young sea lions were playing tag. Watching them was quite interesting too. In my opinion playing tag can be sheer fun, but the version the those guys did down were playing was closer to “lethal”. It seemed the aim of the game was to push the others under water for as long as possible. The actions of the animals were playful but had a pretty violent look. Every now and then the sea lions would end up in the shallow water and start to snap at each other – again in a playful way, but if they would try that on Dave or me, we would face rather severe consequences. 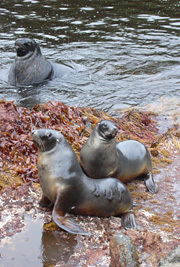 Interestingly, one of the sea lions featured a branding, the unmistakable sign that it had come up from the Auckland Islands. 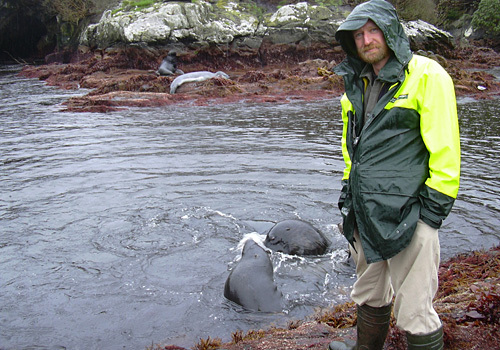 The Department of Conservation trialled branding as an alternative marking method of sea lions. 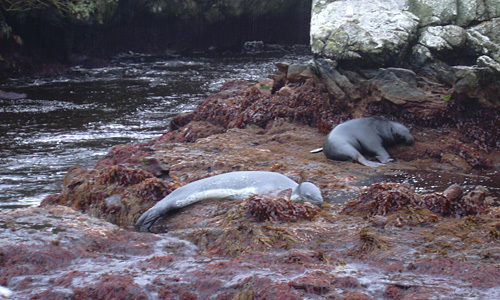 The sea lions population down there is closely monitored by DOC, and the standard method of marking individuals are flipper tags that are attached to the base of the front flippers by piercing the skin and fixing a plastic tag through the hole. The disadvantage of this method is that the tags are prone to fall off and pretty hard hard to read. Looking at the (unbranded) guys here in the harbour that surprises me not. So DOC trialled hot iron branding, pretty much as it was (and probably still is) being used on horses. Only bigger. However, branding was cancelled soon after it started as it potentially had negative effects for the welfare of the animals. This guy here seemed quite healthy and happy. After a good half hour in boat harbour, Dave and I bade farewell to Leopard seal and sea lions and hiked up to the colony for our daily nest checks. Up a the colony, there was still no sign that the Exodus of the male penguins will happen anytime soon. They are all sitting up in the colony, head hunched between their shoulders, obviously trying to ignore the pouring rain. Exactly this rain cut Dave’s and my stay up at our observation sites rather short. It’s just no fun sitting in rain that makes you feel as if you’re sitting under the shower – in full wet weather gear.